He lead the championship for the buk of the season. Reeled off pole positions with dominant frequency. But nah, the car was a dud. Where did the other Ford's come in the championship, I think Scotty played a lone hand? Nick might need to double check his payslip this month. I wonder if the team will have 457 working and 418 student visa holders on $0.49ph? Lol. As the best driver by far, McLaughlin would have been further ahead had he an equal vehicle to the ZB Commodore... Just because a driver can win despite a handicap is hardly parity! the car was a dud. Clear guidelines have been established based on Mustang -- i.e., carbon fibre bodyworks kits are allowed all round. Therefore, it would be better to keep the agreed homologations (with no COG stipulation) in 2019 and for Holden and Nissan to homologate new bodywork using carbon fibre door jambs, pillars and sill panels in 2020; in the process they could address their perceived aero weaknesses too. 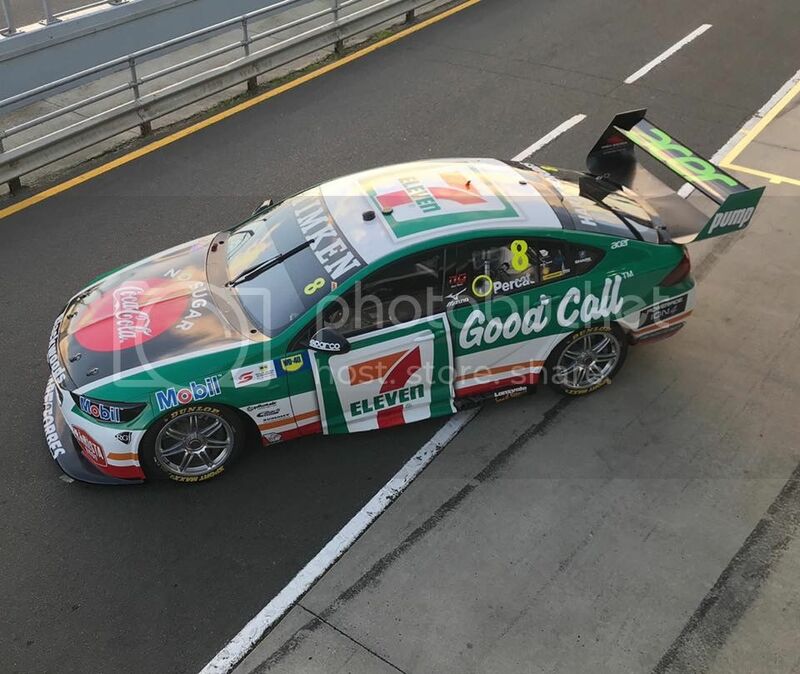 Just stick with the VCAT equivalence which works fine -- it gives a number to work to (downforce & drag at 200kmhr with zero yaw), the designers can then chase performance at all other situations. With full carbon-fibre reinforced plastic bodywork on all entrants (supposedly Mustang requires 120kg ballast [thanks to the hard work of Tickford & DJRTP designing a wonderful lightweight bodywork kit], so the car could easily have 100kg taken out -- the same would apply to the rivals once they homologate new bodywork kits based on full carbon-fibre), the weight of these lumbering "touring cars" could then be reduced by 100kg across the board which would be great! 650hp/1295kg is a damn sight better than 650hp/1395kg! Last edited by V8 Fireworks; 11 Apr 2019 at 13:28. Lol at anyone wanting "close racing", seemingly only come up with the idea this season though? Given the hysteria lately about Holden's chequebook have all the Ford whiners forgotten 888 being untouchable in Fords too? One team dominating for a period of time doesn't indicate a parity problem. I agree with Ryan Walkinshaw though, it is clear there is now an arms race where the resources poured into creating have created a vehicle that lives outside the ability of the historical testing for the purposes of establishing parity. New methods should be sought but 2 rounds in I think is perhaps inappropriate. On the flipside if we had 6 Mustangs heading most races except when they tread on their own feet, it's no good either. Also important to say the Ford teams are as much of a part of the decision making process and have a vote in the sport like anybody else. Not to mention, one team dominating DOES indicate a parity problem. The whole point of parity racing is close, fair racing - it's not really important why their is disparity, only that it be addressed. Lol at referencing Walkinshaw's whine to silence the 'whiners'. And one team is currently dominating the very initial stages of the championship, so by your count there's not a parity problem. Good to know. 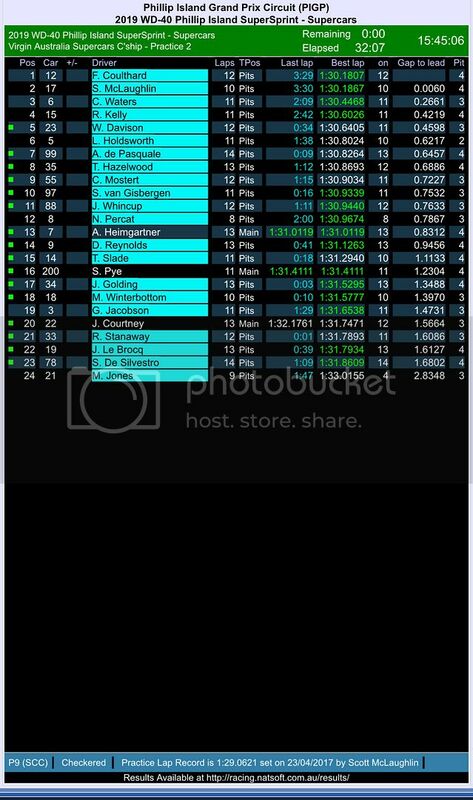 Ummm, anyone know who Rick Kelly was returning 'the bird' to at the entry of pitlane deep in that second session? Maybe it was a Nissan rep? Maybe he was telling everyone what position he'd be in if it wasn't for the Mustangs? And yet Hazelwood in Whincups 888 Commodore from last season is ahead of both his factory team mates. So is it a parity problem because the bench mark team aren't dominating and get beaten by their old toy's?